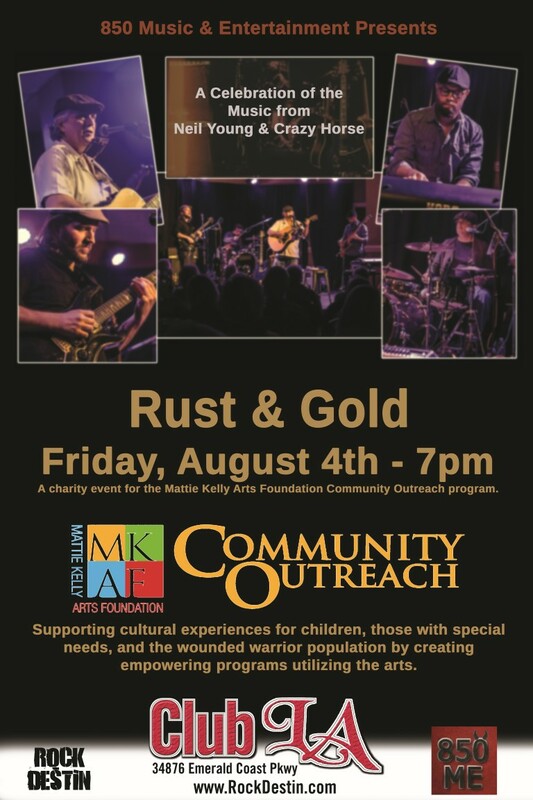 On Friday, August 4th Rust & Gold – A Neil Young Tribute will perform at Club L.A. In Destin as part of a benefit for the Mattie Kelly Arts Foundation Community Outreach program. The Mattie Kelly Arts Foundation Community Outreach Program supports cultural experiences for children, those with special needs, and the wounded warrior population by creating empowering programs utilizing the arts. They currently provide programs in both Walton and Okaloosa counties. The event will include a raffle to benefit the program, as well as limited VIP seating. Doors will open at 7pm for the event. This entry was posted on July 22, 2017 by 850music in Posts and tagged press release.